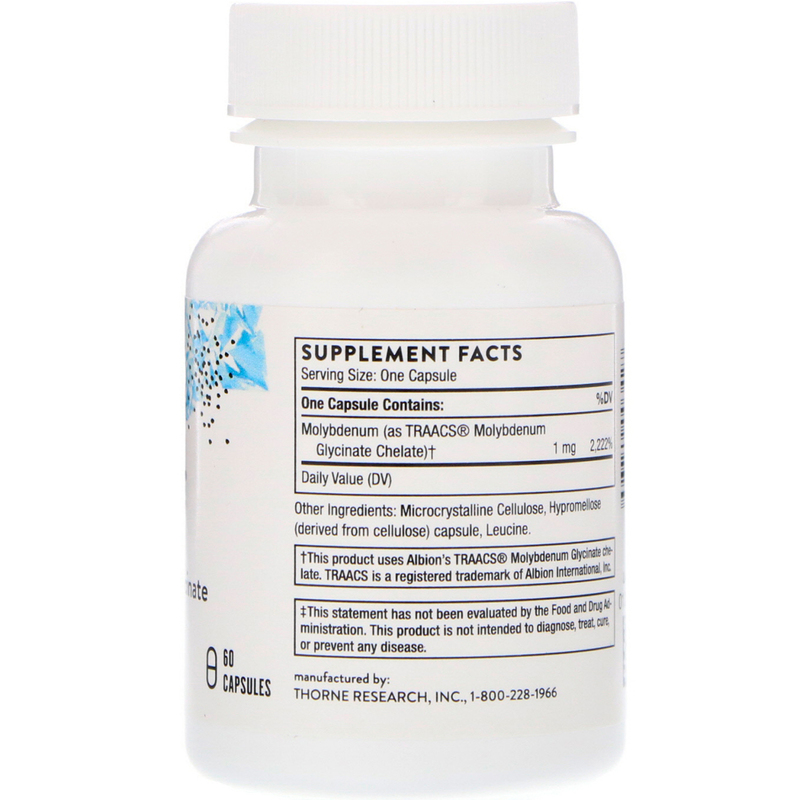 This key trace mineral promotes liver detoxification and benefits sulfite-sensitive individuals. Molybdenum, as a cofactor for sulfite metabolism, benefits individuals with sulfite sensitivity. 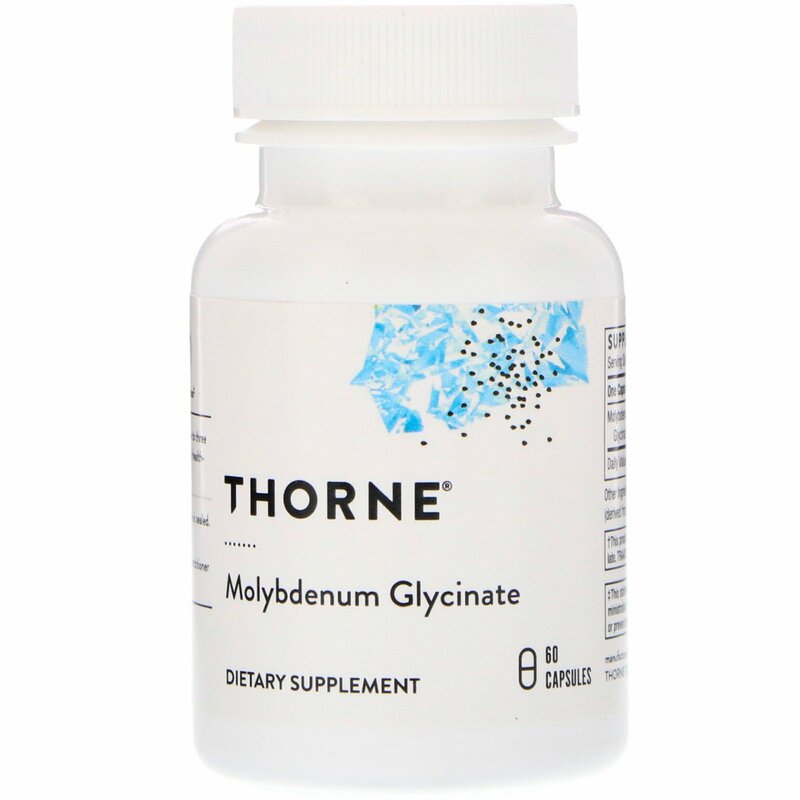 Molybdenum Glycinate is a well-absorbed chelate. Molybdenum is a cofactor in three important enzymatic reactions – xanthine oxidase/dehydrogenase, aldehyde oxidase, and sulfite oxidase. The first two enzymatic reactions play a role in the liver's detoxification of environmental toxins, certain drugs, estradiol, and progesterone. Because molybdenum – as an essential cofactor for sulfite oxidase – enhances sulfite metabolism, supplementation with molybdenum glycinate benefits individuals who suffer sensitivity to sulfites used in meat, fish, salad bar items, and dehydrated fruits and vegetables. Thorne's Molybdenum Glycinate is a highly absorbable form of molybdenum. Sulfite sensitivity can manifest in a number of ways, such as wheezing, chest tightness, coughing, shortness of breath, flushing, itching, hives, swelling of eyes, hands and feet, nausea, headache, and diarrhea. Sulfite oxidase, the most important molybdenum-dependent enzyme in humans, oxidizes sulfite to sulfate, the final step in the metabolism of sulfur-containing amino acids. Microcrystalline cellulose, hypromellose (derived from cellulose) capsule, leucine.